Planning a summer vacation or looking to get away for a night or two? Here are some current promo codes to use on hotels and summer travel plans to help save some money just in case you are planning to book something soon! Keep in mind that most promo codes currently available expire tomorrow, Wednesday, June 22, 2016 and may have some restrictions depending on the site and hotel, so you may have to play around with the codes a little bit to figure out what works best. Hotels.com: Hotels.com: Save up to 50% during our 4th of July Sale + an extra 8% off select hotels with code SAVE8JUN16 when booked by June 26, 2016. Travel must be completed by July 31, 2016. CheapTickets: 17% off select hotel stays with code HOTSTUFF when booked by June 26, 2016. Travelocity: Save 16% on Participating Hotels (Min. Spend $300) with promo code Summer16 when booked by June 22, 2016. You may also want to check out Groupon Getaways and LivingSocial Escape for some more hotel and getaway deals. Keep in mind they may only have certain dates available as well as certain restrictions so make sure to read the terms carefully. Are you going anywhere fun this summer? Do you know of any other hotel deals that I may have missed? *If you are looking to visit Boston this summer and are looking for inexpensive places to stay in Boston, make sure to check out this post for some tips! This post contains affiliate links. Please see my disclosure policy if you have any questions. Save $100 off 2-Night Hotel Stays with Promo Code! Wow! If you are looking to stay at a hotel before June 30, 2014, you may want to check out this hot hotel deal from Orbitz and Visa Checkout! Save $100 on select 2+ night hotel stays when you pay with Visa Checkout and use promo code VISACHECKOUT. (If you are not familiar with Visa Checkout, it is very similar to PayPal and you do not need to pay with a Visa credit card to use it). Book a qualifying standalone, pre-paid $100 or more hotel stay for two or more nights with travel occurring between December 10, 2014 and June 30, 2015 via Orbitz using Visa Checkout as the payment method and promo code VISACHECKOUT, and receive $100 off your booking. Most major chains are excluded; to find participating hotels look for the “PROMO CODE ELIGIBLE” message on Orbitz.com hotel listings. I went to Orbitz and selected a random weekend in February (my birthday weekend/during February vacation week actually) to see if any Boston hotels were participating in this deal! Yes! Look for the PROMO CODE ELGIBLE underneath the rate, which makes it easy to find a participating hotel! After the promo code, you would be spending less than $70/night (+ fees) in Boston which is a really good rate for hotels in Boston. (There were Boston Hotels cheaper too, especially depending on your dates). 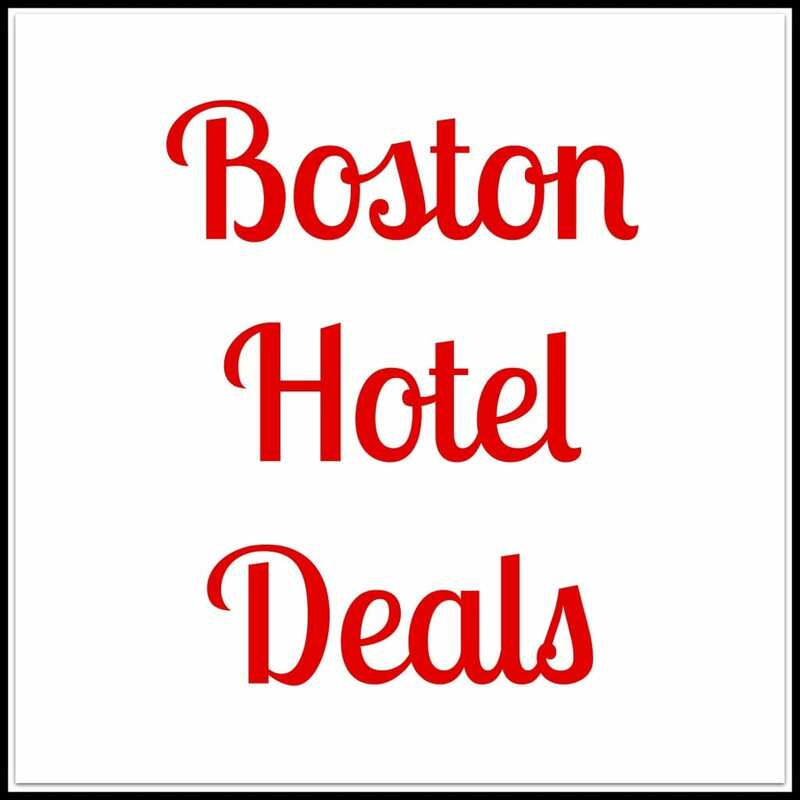 If you live in Boston, you can definitely check out hotels in other locations through Orbitz. Keep in mind this is a while supplies last thing, so I’m not sure how long the promo code will be valid for. For more information or to book a hotel through Orbitz, please head here. Let me know if you find anything really good! Happy (cheap) Traveling! *This post does contain affiliate links, which means I do get a small percentage if you end up making a purchase through my link above. Thank you. Please see my disclosure policy if you have any questions. 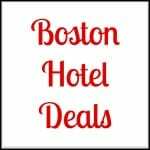 Cheap(er) Boston Hotels and Summer Travel: Hotels.com Promo Code! If you are looking to book a hotel room this summer, you may want to check out Hotels.com. They are one of the first sites I typically check when I’m dreaming of a future weekend getaway. If you decide to spend $300 or more on a hotel booking, you can use promo code MOREMONEY (valid until 6/1/14) to save $50 on your next booking. You do need to travel before November 19th, 2014 to receive the $50 savings but works perfect for spring, summer and even some fall plans! 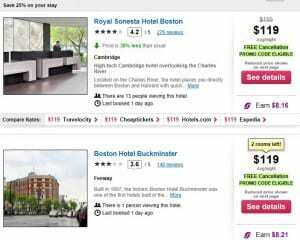 I was a little curious to see what was available for the upcoming memorial day weekend, and I noticed a lot of the (Boston) listings showed the promo code underneath the hotel. This was a nice feature because I had an idea what hotels would accept the promo code and ones that probably wouldn’t (a lot of the Boston ones did in my quick search). For more information or to book a hotel for a future getaway, please head here. Note: I am an affiliate partner of Hotels.com so I get a small thank you if you book through my affiliate link above. Please see my disclosure policy here. Groupon Getaways: Discount Hotel Rates at Marriott Copley Place! If you are looking for a cheap hotel in Boston before November, you may want to check out this Groupon Getaway deal featuring the Marriott Copley Place! You can see if your date is available at a decent rate without buying a voucher first. Rates for the Marriott Copley Place start at $159; however, some dates are a lot more, especially in the fall. Note: I could only find a few $159 rates and they were all for the end of November. However, I did find some decent rates for a few weekend dates (late July for example), which may be a good option when you overlap with a few other deals (see below). You can find more details about this daily deal here, and make sure you read all the fine print before your purchase, read hotel reviews, and also compare rates from other sources before you buy. This deal is available for 14 more days or so; however, if you purchase by 5/16/14 you can save 15% (max discount $50) with promo code TOP15 at checkout! Also, make sure to check out through a cashback website like Ebates or Shop At Home to save 6% and 5% back on your purchase! This would make the hotel room roughly $127 after promo code and Ebates cashback. *This post does contain affiliate links. Please see my disclosure policy here. $10 Off at Hotels.com with Promo Code! If you are planning to book a hotel for any reason, you may want to do so soon. Hotels.com is offering $10 off $100 or more with promo code FEBOFF10 by Sunday, February 23, 2014 for travel dates by July 1, 2014!! Get $10 off $100 with promo code FEBOFF10 at Hotels.com for hotel stays by 7/1/14. Book by 2/23/14. I’ve been playing with the promo code and found every hotel does not participate in the $10 discount, but a lot do. I used Boston as my base, but you can use the promo code for anywhere. Warm weather anyone? You also do not need to put in personal and credit card info before entering the promo code to see if the promo will work for your hotel choice. Just enter the promo code and hit enter, and you will either see an error message or the promo code applied. Hitting the “apply” button won’t work (at least for me on Internet Explorer) but hitting enter did. This will give you a chance to see whether or not you can receive the extra $10 off before you decide on a hotel… every dollar counts right? Visiting Boston soon or this summer? Do you have any trips coming up? Any weddings or special events coming up? Fingers crossed you’ll find a great hotel deal with hotels.com! For more information or to book a hotel, please head here. *I am an affiliate partner of Hotels.com and receive a small thank you if you book through my link above. Please see my disclosure policy here if you have any questions.